Are you bored of spin classes and biking the same old trails at home? The cure is Vietnam. 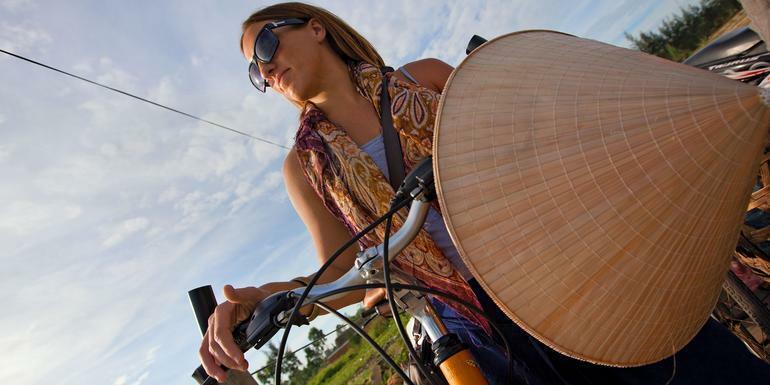 This 14-day trip is one of Asia's classic cycling journeys, riding from Hanoi to Ho Chi Minh City, giving you a unique viewpoint of the countryside. With thousands of kilometres of stunning beaches and beautiful coastal roads, as well as some of the freshest seafood around, this ride is an indulgent experience whether in or out of the saddle. Prepare to have your cycling legs challenged. This trip was a fun experience with good level of activity. 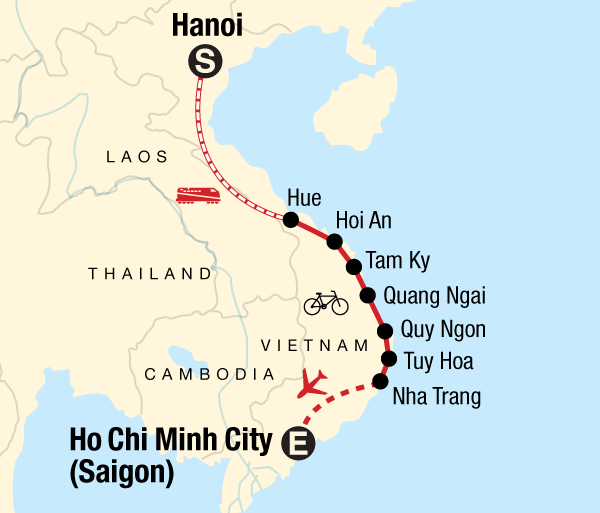 This was my first trip in Asia and Vietnam. The cycle tour was the perfect way to get aquatinted with the country and really see what it's like. G Adventures and their CEO Son were the right choice for this first timer. It has been an unforgettable trip and one I will cherish for the rest of my life. I can't wait for the next one! Absolutely amazing, a holiday of a lifetime experiencing the contrasts of Vietnam. The cycling was tough but so worthwhile and lots of fun. Each location and hotel was great, local knowledge was fantastic and our rep was the best ever! Only ground transport Bicycle, bus, plane, train. Hotel (12 nts), overnight train (1 nt). Guides Chief Experience Officer (CEO) throughout. Days cycling: 8 Distance cycled Approx 567km Difficulty Moderate - this trip involves some riding uphill and longer days over 80km. Riders should be of reasonable cycling fitness but feel free to hop in the support vehicle if any of the riding is too hard. Cycling conditions Road conditions in Vietnam are good. Apart from some short sections on dirt the entire ride is on sealed roads. We will be spending time on Highway One so be prepared for traffic that can (and probably will) include trucks, buses, motorbikes, bicycles, pedestrians, children, dogs, chickens, and other fun things. You will need to stay alert at all times. Helmets For safe cycling we highly recommend wearing a helmet whilst cycling on our trips. We highly recommend that you bring your own helmet with you. You can hire helmets locally or purchase in Hanoi at the start of the trip (approx cost $30 US), but please note that the quality of helmet may not be as good as what we are accustomed too. Support vehicle For the cycling days we will have the backup support of a small bus that will carry our luggage, snacks, water, and anybody not cycling. Eating is a big part of traveling. Travelling with G Adventures you experience the vast array of wonderful food that is available out in the world. Generally meals are not included in the trip price when there is a choice of eating options, to give you the maximum flexibility in deciding where, what and with whom to eat. It also gives you more budgeting flexibility, though generally food is cheap. Our groups tend to eat together to enable you to taste a larger variety of dishes and enjoy each other's company. There is no obligation to do this though. Your group leader will be able to suggest favourite restaurants during your trip. Included breakfasts will usually be asian style consisting of noodles or congee (rice porridge) or bread and eggs. Vegetarians will be able to find a range of different foods, although in some areas the choice maybe limited. While trekking in remote regions food is included, plentiful and made of fresh local ingredients. For all trips please refer to the meals included and budget information for included meals and meal budgets.